Dr. Jill Biden mets with Dean Mercer, future teachers and faculty at Fort Riley Middle School earlier this month. Jill Biden, Second Lady and co-founder of Joining Forces, was at Fort Riley April 6 where she visited local schools and complimented Dean Debbie Mercer on being an early adopter of the Educate the Educator initiative. In an interview with “The Today Show” about her visit, Biden said she appreciates the way teacher preparation programs are embracing military-connected children. “Teachers’ colleges have stepped up to educate people going into education so that they will realize that there are military children in their classroom and celebrate those children and make their transitions easier for them,” Biden said in the interview. During her speech at the White House Convening on Operation Educate the Educator, Biden specifically thanked Dean Mercer for her support as K-State was one of the first 100 colleges in the nation to embrace the initiative. The college created a documentary “A Walk in My Shoes: Military Life” and developed a non-credit class for pre-service teachers wanting deeper knowledge about the needs of military-connected learners. 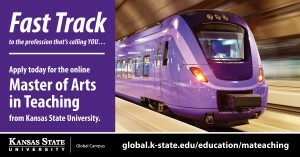 K-State’s new program offers scholarships for those planning to teach in underserved schools in Kansas. The College of Education is accepting applications for a unique path to the classroom for college graduates nationwide who want to become elementary school teachers. Scholarships are available for those planning to teach in underserved schools in Kansas. Classes begin in May. 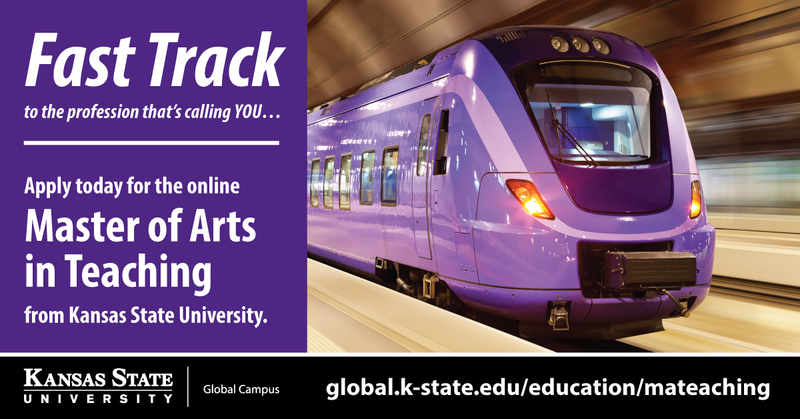 The Master of Arts in Teaching, or M.A.T., is an intensive, one-year online degree specifically designed for people who have already earned a bachelor’s degree but want to pursue their dream of teaching. This pathway enables qualified Kansans and residents of other states to earn the degree in 12 months and be recommended for Kansas’ initial teacher licensure in grades K-6. The rigorous curriculum is delivered by online coursework, and field experiences are arranged in accredited elementary schools convenient to students in the program. Once out-of-state students pass the Kansas licensure exam, they can seek licensure in their home state. Debbie Mercer, dean of the College of Education, believes this innovative program can help address the state’s and nation’s projected teacher needs while maintaining high professional standards. Thomas Vontz, professor of curriculum and instruction, said that another innovative aspect to the degree program is the Kansas Transitions to Teaching, or KTTT, project that will provide a $6,000 fellowship and funding to purchase necessary technology for 30 career changers from underserved school districts in Kansas. KTTT fellows must complete the program, obtain the necessary licensure and engage in full-time teaching in an underserved geographic area in Kansas within six months of licensure. The college has partnered with school districts in Great Bend, Kansas City, Topeka, Dodge City, Garden City and Liberal for the KTTT project.